For its next trick, an internet-beaming balloon factory spun out of Google believes it can outmaneuver the wind. In doing so, the 4-year-old "Project Loon" says it will be able to bring remote parts of the world online more quickly with a smaller fleet of the balloons than it previously thought. Engineers involved in the eccentric project, a part of the X Lab owned by Google's corporate parent Alphabet Inc., say they have come up with algorithms that enable the high-flying balloons to do a better job anticipating shifting wind conditions so they hover above masses of land for several months instead of orbiting the earth. X now expects to need fewer balloons to fulfill its goal of delivering internet service to billions of people living in unconnected regions in the world, ranging from small villages in Africa to the woods of California. The need for fewer balloons should lower Project Loon's costs and accelerate plans to start selling internet-services subscriptions to consumers and businesses. The X lab, like other parts of Alphabet that are funded by Google's highly profitable digital advertising network, is under pressure to start making money on its own. The Alphabet subsidiaries operating outside Google, a hodgepodge of far-flung projects, have lost a combined $7.1 billion during the past two years. In an acknowledgement of their lofty goals and risky nature, Alphabet CEO Larry Page calls them "moonshots." Astro Teller, who runs the X Lab, declined to provide a specific timetable for when Project Loon might start selling internet access plans. 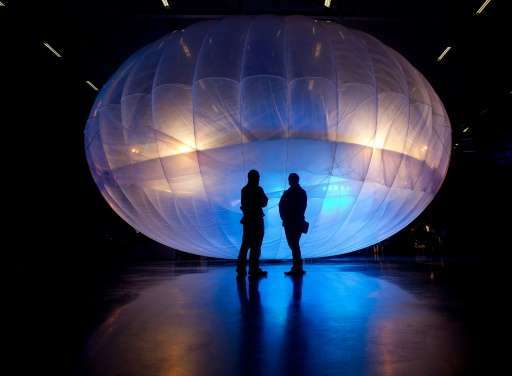 Meeting with reporters Thursday at X's headquarters in a former shopping mall in Mountain View, California, Teller said the project hopes to team up with a telecommunications provider within the next few months to begin testing how well the balloons' new navigational system will work. He likened the newly developed algorithms' objectives to "a game of chess with the wind." If the algorithms prevail in their metrological battle, Project Loop hopes to need only 10 to 30 beams floating about 60,000 feet above the earth to transmit high-speed internet signals to a target market, instead of up to 400 balloons orbiting around the globe. Keeping the balloons in smaller clusters will also make them easier to locate and retrieve once they descend back to land after several months in the stratosphere, Teller said. Project Loon has been doing most of its testing recently in South America, although Teller said that isn't necessarily where it will team up with a telecommunications provider to determine the effectiveness of its wind-defying technology. Since launching in New Zealand in 2013, the balloons have traveled 19 million kilometers, or nearly 12 million miles, according to Project Loon. Alphabet frames Project Loon as a noble endeavor striving to enable people currently without reliable internet service to tap into the vast reservoir of knowledge, entertainment and conveniences available online. But it could also enrich Google by expanding the potential audience that can query its search engine, watch video on YouTube, correspond through Gmail and click on digital ads.